I was sad to learn via Facebook that Maureen Brian died earlier today. She had been unwell for quite some time. Maureen lived just down the hill from me, and was single-handedly responsible for arranging PZ Myers’ appearance at the Hebden Bridge Trades Club in 2014. 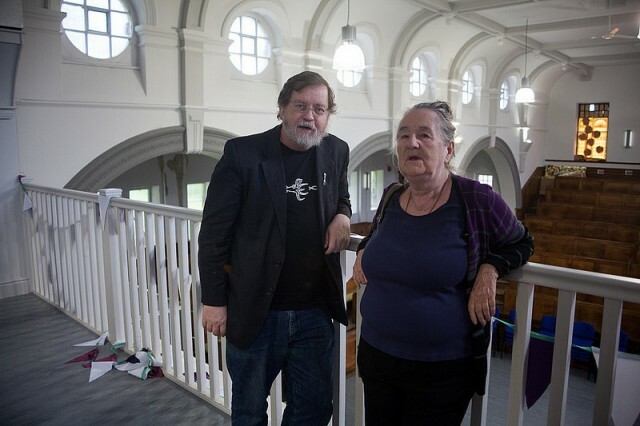 Maureen Brian with PZ Myers in a Hebden Bridge church(!) in 2014. After I got to know her, Maureen told me she had met me (sort of) once before: on Charles Darwin’s 200th birthday of all dates! She was the person standing behind me in Hebden Bridge Post Office as I bought an entire sheet of Darwin Bicentennial stamps, which were issued that day. She said she’d been very concerned I might have bought the post office’s entire stock, as she was also after a set! I’ll miss her occasionally outspoken updates, and frequent ‘likes’ on social media. Just come across your blog post, and that great photo which I'd not seen before - which of course made my blub, but after that I just wanted to thank you for the post. Mum would have been chuffed.